Lucy Stone is thrilled to be cast as an extra in a festive period film...until the set becomes a murder scene decorated in blood and buttercream icing. Returning to her role as sleuth, Lucy dashes to restore peace to Tinker's Cove, unwrap a cold-hearted criminal's MO, and reveal how one ornate yule-log cake could possibly cause so much drama. Hayley Powell's holidays aren't off to a very merry start. 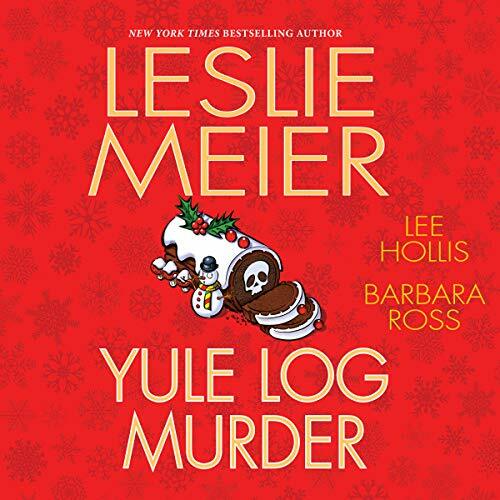 Not only has her daughter brought Connor, an infuriatingly perfect new beau, home to Bar Harbor but a local troublemaker has been found dead with traces of her signature yule-log cake on his body. Realizing she can't make a decent Bûche de Noël to save her life, Julia Snowden enlists the help of her eccentric neighbor, Mrs. St. Onge, in hopes of mastering the dessert for Christmas, but soon she must save her neighbor from becoming the next Busman's Harbor resident to meet a not-so-jolly fate. What has happened to Lucy Stone? And her family? I don't count myself as a real devotee of the Lucy Stone series, but the 4 or 5 I've read in the past have been very entertaining. The Stone family was a pleasant one - its members seemed rather nice and appeared devoted to each other. What an unpleasant surprise to find that in this story, they've all morphed into thoroughly unpleasant people. Lucy's turned into a shrew, and her educated and former Wall Streeter husband into an ignorant boor. The situation with the visiting son and daughter-in-law is preposterous, and Lucy's willingness to abandon her family and home to help with an outside catering job is just nonsense. If Ms. Meier's is attempting to insinuate some real-life situations/attitudes into her stories, I suggest she re-evaluate her relationship with her readers. We want amusing and clever cosies; if we want real life drama, we can watch the news. My dislike of the title story prompted the low rating for this book. The second story was enjoyable; the third a bit tedious but overall, OK.
Lee Hollis & Leslie Meier save the day! Lee Hollis & Leslie Meier saved this book! The “headline” story is from Barbara Ross, but that story was an awful bore that I barely trudged through. But books 2 & 3 were so charming, that they save the day! Narration was well done & the holiday themed mysteries were lots of fun! Lucy Stone has become the most annoying person on the planet. Her son and his family came from Alaska to spend time with the family at Christmas. Exciting? No, Lucy is mostly concerned that their dog is a pit bull and the child is getting empty calories and watching tv. I see why they moved to Alaska. A person Lucy barely knows is murdered. She spends the next few days before Christmas working n extra job to find the killer. She goes to the funeral home for the “fellowship and gossip and food afterward.” When the daughter in laws mother says EXACTLY the same things Lucy has said, she is offended. The last book was so political I knew I should have stopped there. Lee Hollis and Barbara Ross saves the day for Leslie Meier! I’m so glad there was some good and interesting after I slogged through another Lucy Stone book. I’ve read every Lee Hollis book and will start now with Barbara Ross. Good bye to Leslie Meier.